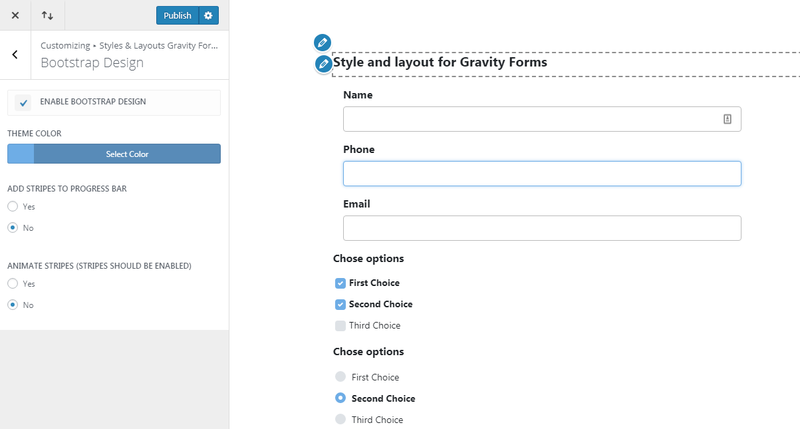 Bootstrap for Gravity forms is an add-on for Styles and Layouts for Gravity forms plugin. With this add-on, you can enable Bootstrap with a single click and customize the look and color of progress bar as well as the theme for Bootstrap. Now Navigate to WordPress dashboard and in plugins click on add new -> upload. Upload the file you downloaded from your WpMonks account. Once the plugin upload is complete then click on activate plugin option. Note: Make sure you have Gravity Forms as well as Styles and Layouts for Gravity forms plugins installed and activated. From your WordPress dashboard go to forms and then edit the form in which you want to apply bootstrap design. Click on Styles and Layout options from the Gravity Forms toolbar present at top of form editor screen. This will open the form preview as well as customizer panel from which you can enable Bootstrap. Go to Bootstrap section in customizer and then click on Enable Bootstrap Design. This will show the preview of form with bootstrap design applied. Click on the Publish button to make the changes live. You can also add stripes as well as animated stripes in the progress bar if you’re using a multi-page form. Although this plugin will work with almost any gravity form field but it has been specifically tested for Text, Number, Email, Website, Date, Phone, Post Title, Post Tags, Quantity, Post Custom, Field, Name, Select, Option, Shipping, Checkbox, Post Category, Radio, Address fields. Just in case any of Gravity Form fields doesn’t show Bootstrap then you can create a support ticket and we will enable bootstrap for that field. On how many forms can I enable bootstrap design? You can enable bootstrap on as many forms as you like. There is no restriction for number of forms. Can I enable Material design and Bootstrap on one form? Both material and bootstrap are separate libraries and using them together will create conflicts so can either use Bootstrap or Material on one form. Will I get support if any of my fields doesn’t show as expected? Yes, you are entitled for support and we will help you make your form look as you want it to. 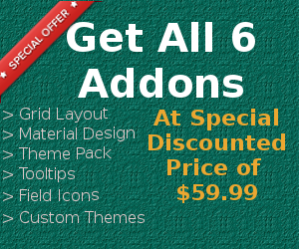 Which version Bootstrap this plugin comes with? We regularly update the bootstrap library used in this plugin. At the moment this plugin is based on bootstrap 4. Will this also change CSS of other HMTL elements on my website? This add-on uses prefixed version of Bootstrap that will only get applied at forms on which it has been enabled without affecting any other HTML element on the website.